So when I ate a great grain salad at a Museum of Modern Art cafe in New York City earlier this month, I knew I would have to replicate it at home. This salad starts with a base of chewy farro, a relative of wheat, dressed with a simple vinaigrette made with good olive oil. Crunchy radishes, barely blanched carrots, and a handful of tender beet greens add layers of color and texture to perk up the palette. I’ve thrown in shaved shallots and a spoonful of salty capers for more interest. At one time, farro was hard to find outside of specialty stores. Now, I frequently see it on supermarket shelves, although it’s always a sure bet at natural foods stores. The grain is nutty, a little sweet, and holds its shape better than many whole grains. Just be sure to buy “semipearled” farro, which cooks relatively quickly yet retains much of the fiber and nutrition of the bran. The beet greens are a bonus when you buy a bunch of beets. I look for the bunch with the smallest and most tender leaves. Larger leaves may be cooked like spinach or used in stir fry for another dish. Get the smallest, freshest radishes you can buy, too. Their crunchy snap and peppery bite are essential for an irresistible salad. Baby carrots also starred in the MOMA salad but I’ve settled for slender young carrots cut into matchsticks. The flavor is best if you dress the salad at least half an hour before serving. This allows the dressing to soak into the farro and there are no worries about wilting. If there are any left overs, they refrigerate nicely. I ate this salad at lunch for several days and the flavor only got better with time. 1 tablespoon capersSimmer farro uncovered in 3 cups of water, salted to taste, for 10 to 15 minutes, until just tender to the bite. Drain and spread out in a single layer on a sheet pan to cool thoroughly. In the same pan, bring 3-4 cups of water to a boil and blanch carrot sticks for about 2 minutes, until crisp tender. Drain carrots and plunge into bowl of ice water to stop the cooking. When carrots have cooled completely, drain and pat them dry with a clean dishtowel. 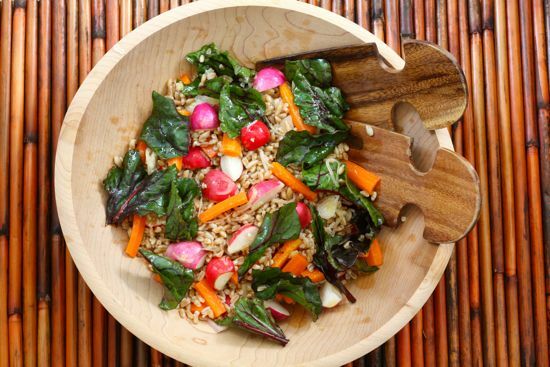 Combine farro, cooled carrots, radishes, beet greens and shallots in a medium serving bowl. Whisk together vinegar and olive oil and season to taste with salt and freshly ground black pepper. Toss salad with dressing, sprinkle with capers and serve. I like the sound and looks of that. And I think I could substitute quinoa for the farro.